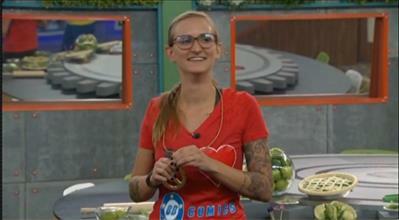 We saw the Power of Veto competition for Week 6 on Big Brother 2014 play out last night on CBS. While many of us were disappointed that Christine won, we did see some pretty cool comic book covers for the Big Brother 2014 cast. Now CBS is sharing all of the BB Comics with us and you can check them out below in our Big Brother 2014 spoilers! While it was all fun and games for the competition, we got to see creepy Caleb return and want to take Amber’s cover for some alone time! I mean, he thought it was smoking hot and would be one million prescriptions! Yeah, I think he missed some of his prescriptions when he recorded that Diary Room video! Production did some nice work on these covers….I was a fan! Donny’s is my favorite for sure! Same here and when Caleb said prescription I thought I was going to roll right off the couch. I am telling you Amber better be prepared in the outside world of this nut case. Yea, for a half second, I thought he realized his mistake and was about to correct himself. Alas, no. Wait until he gets voted out and looks back at how he has made the outside world see him as a fool. Sadly, I think he lives in a delusional world of his mind’s making. He will justify to himself anything he’s done in that house. I just wonder if he has the kind of friends and family who will be honest with him and make sure he gets help … or something! I agree Todd, they did an excellent job! I love Donny’s the best as well. I think Brittany’s is kind of cool and incorporating the soccer kicks. LOVE these!! I would like to have all of them. Although i like Donnys and Zachs best. They should have drawn snakes all over Jocasta. I’m starting to agree with you about the Christine/Caleb thing. At least Caleb has remained loyal to his alliance. And even though his obsession/ego is a bit over the top, he does make for good tv. Christine has displayed some not so nice qualities also. And some of them have nothing to do with her game strategy. The sooner she goes, the better. Pat you are not alone on that last part! looking forward to tonite’s show, should be good with double eviction!! don’t know who my fav is but I do think Derrick is favored to win & has played the best game so far. No one is onto his real occupation either! but sorry, yeah not a fan of Donny’s and do wish he’d shave his beard. I think he’d look much better!! but I definitely am for Christine and Jocosta leaving before he does! Twice Frankie has mentioned he thinks Derrick is a cop. To Derrick. And both times Derrick has deflected his curiosity with sarcasm. Derrick is the King of deflection, isn’t he? He never actually answers questions he doesn’t want to answer. He asks another question or mocks the suggestion. I don’t know if he’s a good guy or bad guy, but I can definitely see why he might have been a good undercover cop!